Happy Halloween from Aldrich House! 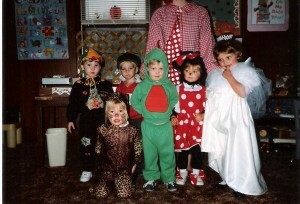 This pre school Halloween picture is with the “BRIDE” Miss Alyssa! Next is Miss “Minnie Mouse” our Miss Jaime, the cutest mouse you will ever see! Posted in Grandma, Todaywith 2 comments. When you are a “FIRST-GRADER” there comes a day, when you grow up in a hurry! For a “KID” I generally was the happiest of kids! Being the first, in the family I usually knew what was going on and what was about to happen, as it always helped me to keep my ears – listening? I believe that I had heard someone say, “Are you paying attention, to what I am saying?” That phrase is boring and makes no real sense to hear, once it has been said? So I have myself always in listening mode! What an explosion, when I opened the door, coming home from school, in such a good mood? One million questions bang, bang and what did you, and where did the matches come from? If ever a “KID” needed a good lawyer, it sure was then! I’m hardly in side, cannot figure what is going on or what happened, but I do see “SNEAKY TOMMY” – on the wooden red stool, trying to look all innocent , as if I had done something terrible? I am ushered into the room where “SNEAKY TOMMY” had taken the matches out of my pencil box and started lighting them. And since they were such short and little matches, I guess he could not hold on to them, dropping them instead, and near the window the curtains caught on “FIRE!” I heard at least a hundred times of all the damage that could have been done, as well as they also could have died! “LUCKY” for us that my father has “eagle ears and nose” to see and hear what “SNEAKY KIDS” might do and be able to immediately “POUNCE DOWN” on the emergent situation! Did I say I was “LUCKY” too, – if there had been any real damage done to the room or house, if no adults were in the house, and as dumb as “TOMMY” was to just go and sit in another room, waiting for a fire to come out where he was and burn him and the whole house down? How dumb can a kid get? But, like I said, no damage – I escaped any and all punishment, since “Tommy” stole the matches and did something he should not have done. In some of the pictures that I have posted you can see the room where the fire took place and you can view others that I have and you will see no “FIRE” damage to the room and no damage to the furniture. The dresser with the marble insert was right where you see it in the picture in the 1940’s and then in the 1950’s was sold to an antique dealer for top dollar. “NO DAMAGE” and no fire department, no police, and no orphanage for the children, as there were no reasons to be sent there by a “social” worker! What could be more exciting than to be a big “KID” and getting to go to school with all the kids you know in the neighborhood and be old enough to stay with your class mates all day? Also, being the oldest and first to go to school, a list of school supplies that I would need – was of real importance to me! Naturally, we all went to the nearby stores on Florissant Avenue, and Bryan Hill School was several blocks down from where we would be shopping. Seems like a great area with everything you need, so close to home. The one thing that I just had to have was this special pencil box. It may have been twelve inches long by about three inches wide and maybe two inches in height. The top had a snap type opening in the front, with the top lifting up and back, revealing a drawer that you could pull out for extra pencils and even something that you just might want to hide. At the age that I was, and having two younger brothers, I felt that I needed a secret place that only I knew about? And, that is exactly what I did. I had a small box of stick matches, which no one knew that I had and I put them in the pencil box drawer. Did I hide the matches? NO! My youngest brother “TOMMY” – was nosy and must have watch me with my pencil box and knew what I had and that it was something we should not have? So, the next day, after I had left for school, and our parents were still in bed, “TOMMY” took the matches from my pencil box and decided to have fun all by himself? Tommy starting to light a match and watch the flame, and so short a match started dropping them, and being so close to a window, the curtains caught on “FIRE!” Tommy was now scared and left our room with the “FIRE” catching on fire a paper bag of Tommy’s blocks. Tommy is now sitting in the kitchen on a wooden red stool, not making a sound and not letting anyone know what he had done? He is as quite as a “MOUSE!” But, the falling blocks are making a noise and the fire-smoke has my father’s attention. He runs to the room and with a wet towel, knocks everything burning down and has the fire out. Any other time Tommy has a lot to say, but now he is not talking at all! I’m guessing he would like to say that I had done this, but I’m at school – I would have loved to hear and see what was said and done, but it all was put on “HOLD” till I came home from school! The O’Fallon Theatre at 4026 W. Florissant Avenue gave dishes out on Wednesdays and we started collecting the dishes, by going each week. Before “TV” going to the movies would be the thing to do. I do not know what THEY CHARGES FOR ADULTS, BUT FOR KIDS IT WAS ONLY TEN CENTS. By going to the O’Fallon theatre with my Mother so often, I was learning how to pay for us to get in and hand the ticket to the person collecting them as we went in, and also to keep my half of the ticket, and where to sit inside, so that we could see the picture. All of this was so that I could bring my brothers to see the movies on Sunday afternoons. So, after a time and understanding what all I would need to do and of course feeling secure in taking care of my brothers, while in the Theater, we were now ready to go. Sunday afternoon, I was given three dimes and off we went down Carter Avenue and made a right turn through the gas station at Warne Avenue, and crossed over when I saw the Food Center Store in the middle of the block because if I went all the way down to the end of the black, it would have been too dangerous with my brothers. It must have been around nine o’clock in the evening and my Mother was looking for us in the Theatre, and had someone with a flash-light to help find us. She just couldn’t believe that we would sit so long in one spat. But there was no way I was going to be asking someone what time it was in the middle of a movie, so we watched until someone came and got us! Every time that we were allowed to go to the movies – it was the same old story – we sat, glued to our seats, enjoying whatever was on the silver screen! If children can ever have “fun times” – it surely should be before the age of seven! This new move to north Saint Louis was exactly what I wanted. I was able to run to the “Bakery Store” for morning cinnamon rolls and wrote about the book mobile I discovered on the way. Another story I wrote about was the “scary” times walking to the “Drug Store” for hand packed ice cream for all of the family! Sure am glad that I paid attention to where we were walking and going in the long walks my mother took us on. Walking around the neighborhood has always been fun me, from the earliest days of going on walks, even now in my seventies, alone or with neighbors that also enjoy site-seeing walking. During the early 1940’s – we, Americans were engaged in the “WAR” and there were times when the air-raid sirens, sounded and immediately all lighting in the house had to be turned off and the thick drapes had to be pulled tight shut – not a peep of light to penetrate – or else? One such evening there was someone banging at the front door, yelling to turn off light and pull drapes tight shut! We not only had everything off, but just to see what was going on outside, that night, we all went out and walked to the corner. There were some other neighbors out and some kids, too. So, right there in the middle of the street – no traffic – no lights anywhere – you could almost hear a pin drop, outside? The weather was warm, so I started doing some somersaults, right there in the middle of the intersection. It was like I was on stage. And some of the kids joined in, each of us showing off what we could do! The “search lights” were all over the black skies, looking for enemy planes, and we kids were having fun down here on earth! We moved to north Saint Louis, to an area where the “Brady Family” has lived since coming to America from Ireland! There was the Fairground Park on one side of where we were living and the O’Fallon Park on the other side. My mother would take us for long walks throughout the neighborhood, pointing out all of the important places for me to remember – that when the time came – I could find the correct way to get there. The “Water Tower” on north Grand Avenue then straight south to Natural Bridge Avenue where the Northside Theatre was on the one corner and the Drug Store on the corner where we would stop for a caramel nut sundae. We could then follow Natural Bridge west to Van deVanter Avenue and cut through Fairground Park, or go on down to Sarah Avenue and look at the different homes we never saw before as we aimed toward home. In the other direction, we would travel on Carter Avenue to Warne Avenue, sometimes stopping in at the “PINK SISTERS” for a Church service or go through to the O’Fallon Park. Sometimes on a Saturday or Sunday we would go on then to Calvary Cemetery to see where the Brady’s and Riley’s were resting, nicely – six foot under! The walks we took along Florissant Avenue were some of the best, because there were stores for blocks and blocks. There was a “5 and 10 dime store,” dress and shoe stores, beauty shop, a meat market, a grocery and vegetables stand store, a “live” poultry store. We would go into the poultry store just to see the “live” chickens. You would look over all of the “live birds” they had and pick the one you wanted. Someone would take that selected bird to the back killing it, depending on what you were paying them to do clean and dress the bird – prepare it for you to bake or whatever way you plan to have it for dinner. Best kindergarten school for me was Bryan Hill Elementary School which was also along Florissant Avenue, and the best teacher, my mother liked her!